The sad fact is that new habits can take anywhere from 18 to 254 days to become established. People who want to be more productive at work don’t often have the luxury of waiting months - or years - to increase their effectiveness. What that means to you is that once you learn new time and task management techniques, you are in a “holding pattern” waiting for new habits to take root. If you too have felt powerless to form new habits, GOOD NEWS! 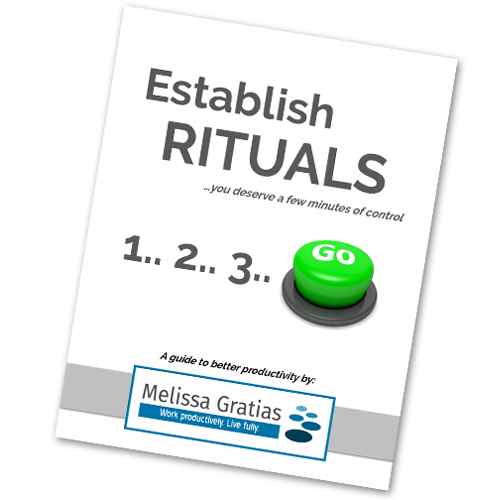 I’d like to introduce you to my eBook Establish Rituals…you deserve a few minutes of control. 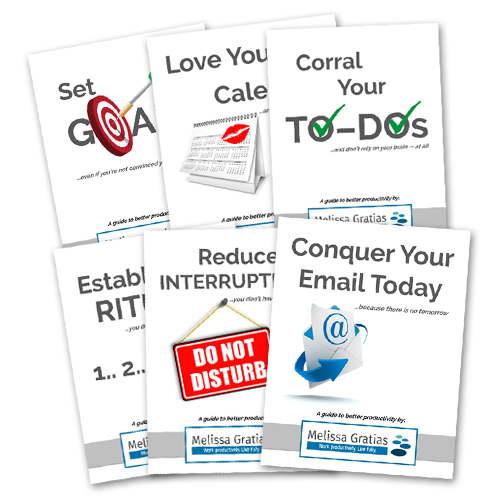 Now you can start good habits TODAY when you get my eBook Establish Rituals…you deserve a few minutes of control for only $3.99. P.S. – I’ve put my very best advice in Establish Rituals…you deserve a few minutes of control. You will finally be in the driver’s seat and not a powerless passenger on the road to forming productive habits. In the fast-paced world we live in, Melissa was able to break down how to schedule daily, monthly and even annual rituals to cause you to stop, take a breath and assess your own productivity. I can go home at the end of the day with a sense of peace; knowing exactly what I accomplished that day, and what I plan to accomplish the next day. I really think I will be able to decrease my stress level and increase my productivity. It will take a few days but am excited about the whole process. Thanks again.